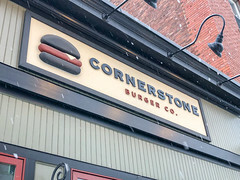 Cornerstone is primarily a “burger bar”, with a good chunk of seating being bar seating, the rest being a bunch of high-top communal tables. It’s a pretty inviting space, especially during a cold and damp Vermont winter day (for which our visit was a good example). 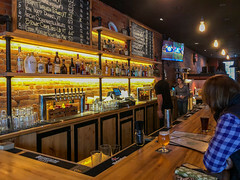 On the bar side of things, they’ve got a pretty good beer list; indeed, Vermont has gotten to the point where I’ve started to seriously worry about a place that doesn’t at least have at least Switchback on tap, and hopefully something from Fiddlehead or Lawson’s at least. Cornerstone doesn’t disappoint, and also nicely leverages the fact that they’ve got Good Measure Brewing next door. Menu-wise, it’s basically “burgers and sides”, but they do have a nice selection. We started with an appetizer of deep fried pickles, which were a bit of a surprise. Having long enjoyed a good fried pickle, I’m always careful to ask whether the pickles are slices (which capture the breading well), or spears (which don’t, I usually end up with a lot of pickle, little breading, and a sad limp pickle that slides out of the breading upon first nibble). Well, these were “slices”, but not like I’ve seen before: first of all, the underlying pickle was huge, and the slices thick, so most of these pickle slices were almost donut-sized by the time they got breaded. But you know what? It worked. 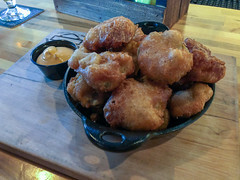 Each was a delicious, dill-laden pickle bomb with a nice breading and a nice sriracha aioli on the side, making for a nice flavor experience. I’ll be honest, I prefer traditional dill chips to these, but I also wouldn’t hesitate to order these again. 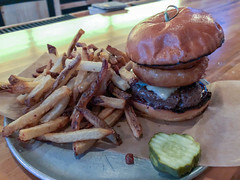 For our burgers, we both opted for the same thing: their Smokehouse Burger: A basic burger with smoked bacon, onion rings, BBQ sauce, and VT cheddar, or in other words, your basic BBQ bacon cheeseburger. But all the parts worked here: my “medium rare” burger was indeed medium rare, the bun nicely toasted so that it maintains texture as you eat, the cheese melted and not overpowering things (sometimes a problem with VT cheddar), and the sauce not overly applied. An enjoyable burger, with some good fries on the side, and I’ll have to say we were both satisfied. While it’s probably not my favorite burger in the region (there’s some stiff competition, with Worthy down one direction and several good Montpelier options in the other), but I’ll have to say that Cornerstone is a nice addition to the Northfield downtown, being part of a rather nice selection of businesses (Carrier, Good Measure, and Cornerstone in that stretch, a nice bakery around the corner, and a good deli down the street). 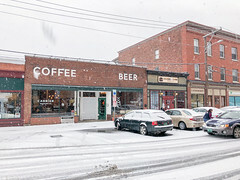 Definitely worth my exploring a bit more as we drive through central VT.
One of the things I enjoy about our (somewhat rare) driving trips to the Detroit area is that, whether we are opting for the US or Canada routes, both take us right through the Buffalo area. Buffalo’s a bit of a run-down metro area, but it’s got quite a good set of culinary traditions, so every time we visit I try to hit up one of the classic spots. For this trip, that was Schwabl’s, so we could get some beef-on-weck.